Note: This information was published prior to the Public Safety Sales Tax vote in 2016. What does a 1/4 cent sales tax mean to you? Click here for a listing of current sales tax rates within Johnson County. The State of Kansas requires any sales tax levied by the county to be shared among cities. The breakdown is 63 percent of sales tax revenue will come to the county to build a new courthouse and coroner facility, while 37 percent of the sales tax revenue goes to cities in Johnson County. This proposed 10-year sales tax would have to go back on the ballot for voter approval in order for it to be extended beyond 10 years. Note: This information was last updated on the day the Johnson County Board of County Commissioners voted to place two public safety priorities on the Nov. 8, 2016 ballot. Today, the Johnson County commissioners agreed to move forward on a new courthouse and coroner facility. The proposed funding is a 10-year 1/4 cent public safety sales tax. In May, county staff will bring back to the Board of County Commissioners language that, if approved by a vote, will be placed on the ballot for the November 2016 general election. The current Johnson County Courthouse in downtown Olathe has housed the Tenth District Court of Kansas for more than half a century. The facility has gone through three additions and at least seven significant remodeling projects through the years, but continues to experience overcrowding conditions, accessibility and security issues, and demands for future space needs for additional courtrooms. Experts, consultants and in-house county staff have analyzed more than 11 sites and 32 courthouse options since 2001. We have spent more than $1.7 million on studies over the last 15 years. Click here for a 10-minute video that highlights the problems with the existing courthouse building and the proposed solution. Studies also concluded that the county’s growth will require more space for court hearings in the future. When construction on the current courthouse building began in 1951, the county’s population was 62,783; today the county’s population is approximately 575,000 — a figure that’s expected to jump to 700,000 by 2025. Click here for a collection of photos that highlight some of the largest areas of concern with the existing facility. Plans and discussion are now underway about how to move forward with the Johnson County Courthouse — the proposed solution is to construct a new 28-courtroom courthouse across Santa Fe Street north of the existing building. If plans to construct a new courthouse do not move forward, the county will need to renovate and add on to the existing facility while it is in use over the course of the next 13 years. The Board of County Commissioners has discussed the courthouse project during several Committee of the Whole sessions; the next such discussion scheduled for April 14 at 11:00 a.m. The public is welcomed to attend Committee of the Whole sessions or watch them online here. During a BOCC meeting in April, the commissioners will officially vote on whether or not to bring the project to a public vote in November. See a collection of photos that highlight some of the largest areas of concern with the existing courthouse building. Since the creation of Johnson County in 1855, the county court system has occupied three different facilities. The current building has housed the Tenth District Court of Kansas for more than half a century. In the beginning, Johnson County used space on the second floor of the Harry Case Building (built in 1859) as the county courthouse. The first Johnson County courthouse, circa 1870. The first permanent courthouse in Johnson County was on the top floor of this building in Olathe. Photo courtesy of the Johnson County Museum. Then county voters approved a special tax to build the first official county courthouse at a cost of $36,414. Located north of the present courthouse, the three-story brick building opened in 1892. The current courthouse opened in 1952. When construction began in 1951, the court system had only three judges. The county population was approximately 63,000. The facility had nine floors and almost 235,000 square feet of space. Besides the court system, the courthouse housed most county government departments. The Johnson County Courthouse circa 1952. Photograph courtesy of The Kansas City Star. In 1954, the county made an addition to the building, followed by a third wing in 1968. By 1975, the courts had expanded to eight judges. The county population had increased fourfold — to more than 237,000 residents. In need of more space, the county added an eight-story tower onto the east side of the building. Johnson County Courthouse, 1971. Photograph courtesy of the Johnson County Museum. Through the years, the building has evolved to address the continual need for more space. The jail moved from the fourth floor to new detention centers in Olathe and Gardner. As of 2016, the courthouse had 19 district courts, four magistrate courts and three hearing officers. It saw about 400,000 visitors per year. It housed the law library, the Clerk of the District Court and District Attorney’s Office. Studies also concluded that as the population grows, the county will need more space for court hearings. Construction is underway on Johnson County’s new 28-courtroom courthouse in Olathe. The new courthouse is being built across Santa Fe Street north of the existing courthouse and west of Olathe City Hall. The address is 150 West Santa Fe Street. The anticipated completion date is the fourth quarter of 2020. The anticipated cost is $182 million ($193 with inflation costs factored in). The contractor is JE Dunn Construction. Design firms are TreanorHL & Fentress Architects. Johnson County voters approved a 10-year, quarter-cent public safety sales tax to fund the project. The courthouse will meet Johnson County's judicial needs for more than 75 years as the county expects to add 10,000 residents each year. Its design will also allow for more courtrooms later as needed. Tours of the current courthouse are available to the public upon request by e-mailing court administration. Mechanical, Electrical, Plumbing, & Fire Prot. The following timeline identifies actions taken since the November 8, 2016 countywide public vote approving a quarter-cent public safety sales tax to fund the courthouse and a medical examiner facility. Dec. 9 - Johnson County Board of County Commissioners adopted a resolution to levy the additional one-fourth cent sales tax countywide for a period of 10 years, beginning on or about April 1, 2017. The Board of County Commissioners amended the county's Capital Improvement Program to include the courthouse and medical examiner projects and authorize the projects. The Public Building Commission approved the projects and sale of bonds. Johnson County negotiated with property owners in block 29 (located one block north of the site of the new courthouse) to purchase the property for a new parking lot for the courthouse. Johnson County issued a number of requests for proposals (RFP) for professional services, including an owner’s representative and a design criteria consultant. Both were approved in 2017 and have been working on the county's project requirements. Johnson County demolished structures on property it purchased for a new courthouse parking lot. The property is located a block north of the site of new courthouse (late October/early November 2017). The Board of County Commissioners voted Nov. 2, 2017, to select JE Dunn/TreanorHL/Fentress as the design-build team. The public heard from the appointed Artist Selection Panel (ASP) as they reviewed and discussed submissions in response to the Call for Artists. The ASP will identify a short list of finalists to be interviewed for inclusion on the Design-Build team. Ultimately, the selected artist will install original, integrated, new public art in the new courthouse. Public engagement meetings were held Feb. 6, 2018, in Olathe and Feb. 7 in Overland Park to provide residents with initial design and plans and receive feedback. Schematic designs were presented to the Board of County Commission on March 22, 2018. Construction began in the second quarter of 2018. Substantial completion in August 2020 and occupancy in early 2021. Despite snow, ice and rain, crews finished a tunnel construction project under Santa Fe Street in downtown Olathe 10 days early. Drivers in the area encountered a detour during the project. The project was originally scheduled for completion on April 18, 2019, but the road reopened on April 8. An underground tunnel runs from the Johnson County Sheriff’s Office Central Booking Facility (101 N. Kansas Ave.) to the Johnson County Courthouse (100 N. Kansas Ave.). This project created a branch off the existing tunnel leading to the new courthouse, currently under construction on the northeast corner of Santa Fe and Kansas Avenue. The tunnel is used to securely transport inmates. Construction began on Feb. 12. Crews put in weekends hours to come in ahead of schedule. The construction project was extensive. Following the street closure, crews sawcut the pavement and excavated across the street, north to south at a 45-degree angle from the new building. After reinforcement and the placement of formwork, 347,000 cubic yards of concrete were poured for the foundations, walls and lid. After the 200+ ft tunnel was waterproofed and backfilled, crews began street repairs. From Kansas to Cherry, the street was milled and repaved. The street reopening included repair to the impacted landscaping, brick pavers and curbs. Detours in the area routed eastbound traffic on Santa Fe south on Kansas Avenue, east on Loula Street and north on Chestnut Street back to Santa Fe. The detour route for westbound traffic on Santa Fe took drivers south on Chestnut Street, west on Loula Street and north on Kansas Avenue back to Santa Fe. Vehicles traveling northbound or southbound on Chestnut Street could not head west on Santa Fe. Vehicles traveling westbound on Santa Fe past Water Street detoured north or south on Chestnut Street. Vehicles traveling eastbound on Santa Fe past Walnut Street detoured north or south on Kansas Avenue. Vehicles traveling northbound or southbound on Kansas Avenue could not head east on Santa Fe. Vehicles traveling north on Cherry Street past Park Street could only travel east on Santa Fe. The tunnel was constructed as a part of the new courthouse project which is funded by a quarter-cent public safety sales tax voters approved in November 2016. Note: This information was last updated after May 26, 2016 and prior to the public safety sales tax vote on Nov. 8, 2016. The deadline to register to vote in the Nov. 8 general election is Oct. 18. Visit jocoelection.org for additional election information. Note: This information was last updated shortly after the Public Safety Sales Tax vote on Nov. 8, 2016. On Tuesday, Nov. 8, Johnson County voters approved a 10-year, quarter-cent public safety sales tax to fund a new county courthouse and coroner facility. The county leadership has studied courthouse options over the past 15 years with recommendations for a new courthouse from numerous consultants, professional staff and citizen advisory groups. Funding the large project prevented the county from moving forward until now. Johnson County does not currently have a coroner facility; it uses a private lab in Wyandotte County. The public safety sales tax approved on Tuesday makes way for the construction of both projects in the next few years. This public safety sales tax funding will be collected starting in April 2017 and ending in 2027. 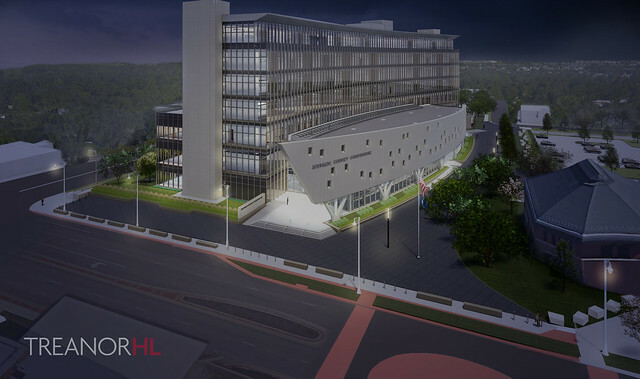 The courthouse design is expected to begin in 2017 with completion in about four years. Staff is currently developing a timeline for the construction of a coroner facility. Next steps include the Board of County Commissioners amending the county's Capital Improvement Program to include the courthouse and coroner facility projects. Following that action, the Public Building Commission can approve the projects and sell bonds.